Looking for REO & foreclosure cleanup in Aventura that you can count on for all of your clean up needs? Look no further than our professional staff at XS Trash. Our team of experts will remove all traces of trash and debris left behind by you foreclosure project. You will not have to do anything. Our professional crew will take care of everything! You will be very impressed with our foreclosure cleanup service. Our team will arrive to your location as scheduled, and will work hard to remove all of the trash. You will not regret your decision to hire us. We will make you our first priority when you hire us! REO & Foreclosure Cleanup in Aventura from XS Trash will not disappoint you! We aim for 100% customer satisfaction on every job we do, and we have not done our job correctly unless you are fully satisfied. You can count on us for all of your foreclosure cleanup needs, regardless of whether you have one item that need to be removed or an entire truck filled with trash. You complete satisfaction is very important to us! 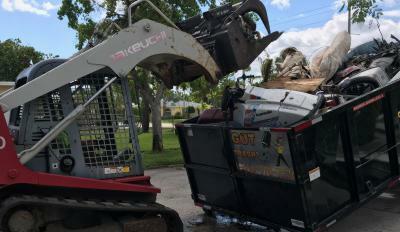 Complete your REO & Foreclosure Cleanup in Aventura with an additional service where you hire bobcat operators who are licensed to help remove trash and debris. For a very reasonable price, they will go to your property and use their bobcats to clean your site. The service trucks that we use are among the largest in the industry, 21-yards long, so we can remove a huge amount at one time! This means we don't have to take as many trips which help you save time and money. Get your REO & Foreclosure Cleanup in Aventura as soon as possible! You do not want to leave trash on your property for too long, because someone could get hurt. There is no reason why we can't quickly remove all traces of trash and debris. We even offer same-day service, so don't hesitate to contact us. Our professional crew will provide you with fast and efficient foreclosure cleanup service.